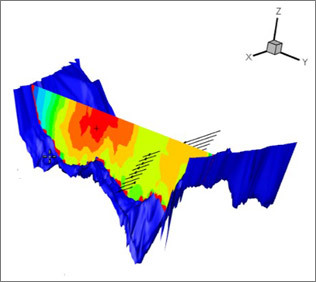 • Merge multiple ADCP/GPS exported data files from a river survey (Matlab format for SonTek ADCPs, ASCII format for TRDI ADCPs) to produce a complete sample set of geo-referenced depth and 3D water-profile velocity data for processing. • Screen and QA ADCP/GPS data based on preset criteria to remove depth and velocity outliers. 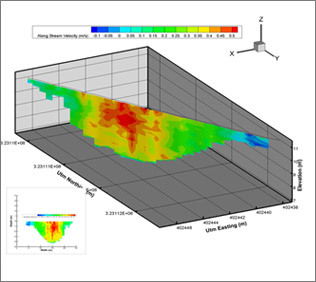 • Calculate a unique geo-referenced beam depth for each ADCP depth beam in order to provide a more precise depth position. 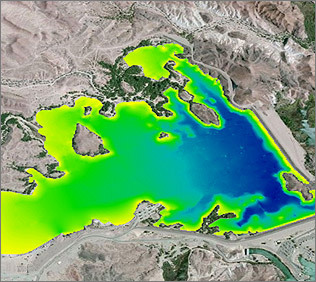 • Interpolate the resulting 5-beam elevation samples into a regular, gridded elevation points throughout the river boundaries. The elevation grid “resolution” is adjustable as needed. • Compute depth-averaged velocity throughout the reach. 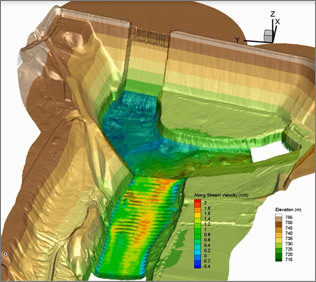 • Provide a series of graphical data outputs based on the processed data to show relevant elevation topography and velocity patterns along the surveyed river reach.